This article was originally written for the June 2015 edition of Wings in the Desert, the newsletter of the Avicultural Society of Tucson. It was reprinted in the June 2015 edition of Flappers, the monthly newsletter of the Flapping Feathers Parrot Club. This online version has continued to be updated as new information becomes available. Click here for a cockatiel-specific version of the article. Fat is an essential part of our birds' diet, but it's very high in calories so we have to be careful about the amount that our birds eat. Veterinarians report that obesity and atherosclerosis are common health issues in pet birds, and eating excessive amounts of fat contributes to these problems. So it's good to pay some attention to the quality and quantity of our birds' fat intake. For a number of years now, a variety of sources have encouraged us to feed oil to our birds, especially red palm oil and more recently coconut oil. But is this really a good idea? I think that in most cases, the answer is no. All oils are a processed food that has less nutritional value than the original food that the oil came from. Oil is 100% fat; it's expected that some of the vitamins and minerals will be squeezed out of the original plant along with the oil, but most of the nutrients get left behind. Eating the whole seed or nut will provide fewer fat calories and more vitamins, minerals and other nutrients than eating the oil from that seed or nut. It seems to me that it's a lot more desirable to feed the seed or nut instead of the oil. Click on the thumbnail at left to see a few examples of the nutrient levels in oil compared to the whole seed. There are different types of fat and they aren't all created equal, so it's important to understand the differences between them. There are four basic types of fatty acids: the Omega 3 fats which are polyunsaturated, the Omega 6 fats which are also polyunsaturated, the Omega 9 fats which are monounsaturated, and the saturated fats which don't have an Omega number. There are several different subtypes in each of these groups. Fats can come from plant sources (which do not contain cholesterol) or from animal sources (which do contain cholesterol). The Omega 3 and Omega 6 fats are essential nutrients, because the body requires them for normal functioning and can't manufacture them. The Omega 9 and the saturated fats are not essential nutrients, because the body can manufacture all that it needs. Eating saturated fat is generally considered to be unhealthy for humans because of the role it plays in heart disease, while the Omega types are all considered to be healthy in sensible amounts. But currently the scientific community is starting to question the assumption that saturated fat is always bad and the others are always good, and it's likely that reality will turn out to be more complicated than that. Omega 6 fats are plentiful in seeds, nuts and grains, and most people and their pets have no trouble getting more than they need of these fats. Omega 3 fats are much more difficult to obtain in the modern diet, so this is the fat that needs some attention. It appears that having enough Omega 3 in the diet helps prevent fatty liver disease (which is a common problem in pet birds) and a variety of other health problems. Since the Omega 9 and saturated fat are nonessential, there's no reason to be concerned about them apart from keeping the consumption rate down to a healthy level. Natural foods usually contain all four different types of fat, but the percentage of each type varies from one food to another and there's usually one particular type of fat that predominates. The majority of plant foods contain mostly polyunsaturated fats, but there are some exceptions: for example avocado and olive contain mostly monounsaturated fat, while palm oil and coconut oil contain mostly saturated fat. Animal sources (meat, eggs, dairy) contain mostly saturated fat. The type of fat that birds eat in the wild will depend on their diet. A species that eats a lot of insects will have a significant amount of saturated fat and cholesterol in its natural diet. But species that eat mostly plant foods (including parrots) will get most of their fat calories from the Omega 3 and 6 fats, since these are the main fats in most plants. If we are going to use fat supplementation in our birds' diet, it makes sense to do it using a type of fat that they need and are adapted to, rather than an unnecessary fat that they would not normally eat. Coconut oil is 90% saturated fat and palm oil is about 50% saturated fat, so they're pretty far removed from our birds' natural eating habits and I don't consider them to be desirable oils to feed to birds. Coconut oil is currently being promoted as a "miracle food" for humans, but it appears that the claims are vastly overblown. Monounsaturated fats are unnecessary and Omega 6 is already well supplied in the diet. That leaves the Omega 3 fats, which are generally hard to obtain in the diet. Many vegetables have a nice percentage of Omega 3 fat, but it's hard to get enough Omega 3 from this source since the total amount of fat in vegetables is usually pretty low. There are a few seeds that are high in Omega 3 fats, including flax, chia and perilla. Flax is the only one of them that is commonly fed to pet birds, and all of these are small seeds that might not interest a larger bird. But if your bird won't eat the seeds, it's possible to buy the oil, and it might make sense to feed a little Omega 3-rich oil to your bird. Kiwi fruit seed is also very high in Omega 3, so if your bird likes to eat kiwi fruit, there's a nice little bonus in the seeds. Some fruit seeds are toxic, so it's important to know your seed - for example peach pits contain cyanide. But kiwi seed is safe and beneficial. Hemp seed is also a useful source of Omega 3, and it's frequently fed to pet birds. Fancy seed mixes often contain it, and some vendors at our bird marts have it. The percentage of Omega 3 fats isn't as high as the other seeds, but the amount is significant and it will make a better contribution to the diet than a seed that has a low percentage of Omega 3. Fish oil and several other types of oil from aquatic sources are high in Omega 3. The Omega 3 fats in fish oil aren't the kind that's found in plant sources however. Fish oil contains two types called EPA and DHA, while the type found in plants is called ALA. Fish oil is best for humans because they can utilize EPA and DHA better than ALA, but birds don't have this problem and do fine with ALA. Fish oil isn't currently recommended for pet birds due to a lack of information on how well they can use it; there have been more studies on birds and ALA so this is understood a lot better. Nutritionally complete pellets have been professionally formulated to provide balanced amounts of all the nutrients that birds are known to need, including the Omega 3 and 6 fats. Feeding pellets as a significant percentage of the diet is an effective way to meet your bird's needs. Pellets aren't truly nutritionally complete of course, since it's not possible for one single food to meet the needs of every individual bird in every parrot species. But for now it's the closest to perfection that we can come, and learning about your bird's feeding habits in the wild will help you make wise decisions about what other kinds of food to provide. The major 'conventional' pellet brands are all formulated for nutritional completeness, including Zupreem, Roudybush, Mazuri, Tropican, and Kaytee. Lafeber's Nutriberries are nutritionally equivalent to pellets; it's the same ingredients but they haven't been ground up as finely, and the 'glue' that holds them together contains vitamins and minerals. Harrisons is the only organic pellet that is nutritionally complete. There are other organic pellet brands, but they were not formulated by professional nutritionists and do not attempt to be nutritionally complete. Their fatty acid content is unknown, but an even bigger problem with these incomplete pellets is that they do not contain vitamin D, which is essential for calcium absorption and is very difficult to obtain through the diet. Wild birds manufacture their own vitamin D using a chemical reaction that occurs in the body when they are exposed to direct sunlight, and birds living in an outdoor aviary will get their vitamin D this way too. The situation is a lot more complicated for indoor birds, and nutritionally complete pellets are the safest and most reliable way to provide them with vitamin D.
There are some parrot species (macaws, Amazons, African greys) that eat palm fruit in the wild, and moderate amounts of red palm oil might be appropriate for them since it is part of their natural diet and they are adapted to it. Macaws in particular are thought to need more fat in their diet than other species. Amazons on the other hand are more prone to obesity and atherosclerosis than many other species so caution should be used in feeding fats to them. Red palm oil has a high level of palmitic acid, which is associated with heart disease in humans. Keep in mind that wild birds have a much higher activity level than captive birds, and the level of fat consumption that's appropriate for wild birds is not appropriate for pets. It's important to keep in mind that too much of any kind of fat is likely to have a negative effect on your bird's health, even if it's the desirable Omega 3 fats. When you're increasing the amount of Omega 3 fat in your bird's diet, it would be desirable to reduce the amount of other fats at the same time so that the total amount of fat calories in your bird's diet stays about the same. Use good sense and moderation to strike a healthy balance with fat consumption and all other foods too. It's best to aim for a variety of healthy foods in your bird's diet to help cover all the nutritional bases, with some special attention to the harder-to-provide nutrients. Four tiny seeds are the richest known sources of alpha-linolenic acid (ALA), the type of Omega 3 fat that comes from plants. They are flax, chia, perilla, and kiwi fruit seed. We know quite a lot about flax, some about chia, and not very much about perilla and kiwi. If it wasn't for their high Omega 3 content, flaxseed and chia would not be considered to be good ingredients for a commercial bird food. These seeds have high levels of fiber and antinutrients, which limits their digestibility and the absorption of nutrients. NutritionData reports that flaxseed is 27% fiber and chia is 38%. There are a number of other food sources that are significantly more efficient at providing energy and other nutrients. But Omega 3 fats are hard to supply in the diet, and the high level in flax and chia makes up for their other shortcomings. Flaxseeds are used frequently in poultry feed because they improve the Omega 3 content of the eggs and meat of the chickens that eat them. This is a very marketable characteristic for agriculture, and in normal life circumstances it is beneficial for the birds themselves. A significant amount of poultry research is available on the most effective way to use these seeds in the diet, and it seems likely that a lot of it will also be applicable to pet birds. Feedipedia reports that the fat digestibility of raw flaxseed (which they call linseeds) is only 61% (you have to click the Nutritional Aspects tab and scroll down to the Poultry section to see this information). The recommended feeding rate for flaxseed is 2-10% of the diet for poultry. Rates higher than 10% may cause problems, and the fiber (aka non-starch polysaccharides including mucilage) gets the primary blame for it (Flax Council of Canada, Apperson page 51). It is not clear whether this specifically means raw whole flaxseed, or flaxseed products in general. Pelleted or roasted flaxseed is preferred to raw seed, because this processing increases the digestibility of the fatty acids by 29-39% (Shen et al). This is a major improvement that is very significant to those of us who are looking for ways to improve our birds' Omega 3 intake. It is not clear to me how flax seed pellets are made, although it appears that cold pressing is one way to do it (Southern Omega). In any case it's probably not something that we can easily do at home. The poultry industry is studying the use of fiber-degrading enzymes to improve the digestibility of flaxseed, but this is obviously not practical for home use either. But it's easy to roast the seeds at home, and it reportedly improves the digestibility of flaxseed for humans too by breaking the seed coat. You can roast flaxseed in a skillet or oven the same way you toast other seeds and nuts (Wikihow) or in the microwave (Whirlpool India) (for microwave cooking, first you rinse the seed with water - microwave frequencies target water molecules so a little moisture is needed for even heat distribution. Then place in an appropriate container, nuke for two minutes, stir, and nuke for one minute more). I don't have any information on how oven roasting compares to microwave roasting, but the papers that I've seen got excellent results with microwaving (Shen et al-1, Shen et al-2). This study used two different batches of flaxseeds that apparently had different beginning digestibility levels, so it's hard to compare the effectiveness of microwaving versus pelleting/autoclaving. Grinding flaxseed improves its digestibility for humans (Mayo Clinic, Nieman et al) but apparently does not improve digestibility for birds (Jia & Slominski). Scheideler & Froning found no difference between whole flaxseed and ground flaxseed in a study of laying hens, although they did find that brown flaxseed produced better results than golden, and storage temperatures ranging from 4-21 C (39-70 F) had no effect. Aymond & Elswyk found no difference between whole and ground flaxseed when fed as 5% of the diet, but got better results from ground flaxseed at 15% of the diet. Keep in mind that levels higher than 10% can be problematic. In general, ground flaxseed is expected to go rancid faster than whole flaxseed. It will stay good for several months if kept in the refrigerator and even longer if kept in the freezer, but I couldn't find any specific information on how fast it goes bad at room temperature (which is the temperature at which it's served to birds). Ground flaxseed loses a lot of its Omega 3 content when it's baked, but whole flaxseed is heat stable and can be baked without loss of Omega 3 (Chen et al). To reduce the risk of rancidity issues, roasting whole flaxseed seems like a more desirable technique to improve the digestibility of flaxseed than grinding. There's less scientific literature on chia seed. It's a lot more expensive than flaxseed, and not popular enough as a poultry feed to have an information page on Feedipedia. But the paleo community doesn't like chia and is eager to tell us about its shortcomings (The Paleo Diet, Lighter Brighter You). The first link is apparently unaware that flaxseed has the same issues that they complain about with chia. It's even possible to find a little point-counterpoint action (Diabetes Developments). It looks like chia's shortcomings are generally similar to those of flax, with one major difference for birds that's described in the next paragraph. A science-oriented book on chia says that "true metabolizable energy of whole and ground chia seed measured using the Sibbald methodology was 693 and 4,089 kilocalories per kilogram, respectively" (Coates). This indicates that grinding chia seed makes a HUGE difference in digestibility, and it appears that they're talking about poultry digestion not humans although it's not 100% clear. The statement appears in a discussion of using chia as poultry feed, and the source of the data has the same last name as a poultry nutrition researcher specializing in Omega 3 issues. I have no idea why grinding would make such a dramatic difference in chia's digestibility for chickens, when a similar difference was not observed with flaxseed. Perhaps the size, shape, and/or hardness of chia seed makes it more difficult for the gizzard to grind it? If so, does the size of the bird make any difference? For example would a small bird like a budgie be better at grinding up these tiny seeds than a large bird like a macaw or chicken? Coates' book also says "Ground chia has shown no significant oxidative deterioration under extended storage periods", indicating that ground chia does not require refrigeration which is a major advantage over ground flaxseed. This is VERY good news. Chia may benefit from grinding a lot more than flaxseed does, but at least it's easy to store and use it after it's been ground up. So ground chia is more practical than ground flax, reportedly due to antioxidants in the chia that help keep the oil from spoiling (azCHIA). The ALA in chia mostly remains stable during baking (azCHIA), but toasting may or may not improve digestibility. The study results are mixed, with Monroy-Torres et al finding that roasting actually reduced digestibility, and Reference #23 of that paper (not available in English) reportedly finding an improvement. It is possible that the timing and temperature of the roasting makes a difference. There are many hype sites saying that chia is much more digestible for humans than flax and can be eaten whole, but this is apparently not true. A human trial found that ground chia had a beneficial effect on blood chemistry but whole chia had the same effect as placebo. The actual point of the study was to see if chia promoted weight loss, which it did not (Very Well, Chia Power). The low protein digestibility of chia is also a strong indicator that chia is hard to digest (Monroy-Torres et al). What about soaking or sprouting the seeds? That would make them softer and presumably more digestible, but wet chia seed produces a mucilaginous gel that may not be appreciated by all. Flax has mucilage issues too but apparently the gel only shows itself if you soak ground flaxseed (Livestrong). The mucilage in both is generally viewed as an antinutrient, although some people use it as a source of dietary fiber. How much of this is applicable to perilla and kiwi fruit seed? We don't know! FWIW, my cockatiels have a strong preference for dehydrated kiwi seed over raw flaxseed, and the dehydration process uses low heat which may improve the digestibility of the kiwi seed. A convenient way to provide kiwi seed is to slice up the fruit and freeze it, and thaw out a slice whenever you need it. The next best sources of ALA are hemp seed and walnuts, which have roughly one quarter to one half as much as the tiny seeds. Walnuts have digestibility issues too, although not as much as flax and chia because we eliminate a lot of the fiber by removing the shell before we eat it. Nuts are not the most world's most digestible food due to their fiber content, and Baer et al found that the actual metabolizable energy of walnuts was only 81% of the predicted amount - the nuts were even harder to digest than expected. This may be good news if you're trying to avoid calories, but it's bad news if you're relying on it to supply Omega 3. If you're not getting the calories you're also not getting the benefits of the Omega 3. Roasting nuts improves their digestibility (Kong & Singh). Soaking or sprouting nuts is also thought to be improve digestibility although this has apparently not been studied. Direct information on the digestibility of hempseed is hard to come by, but presumably it has some of the same issues. If the shell is not removed prior to eating it's likely that the digestibility would be similar to that of flax and chia, and if the shell is removed it would probably be more like walnuts. There are some other fats with Omega numbers, but they are non-essential and not much is known about them. The Omega 7s are a class of monounsaturated fats, and one of them (palmitoleic acid) is being hyped as a wonder food, with the usual lack of substantiation that always seems to accompany miracle claims. In reality, the body can make all the palmitoleic acid it needs, and a healthy individual doesn't need it in the diet. The evidence for palmitoleic acid is mixed, and it behaves like a saturated fat in its effect on LDL cholesterol (Nestel et al). Animal studies have shown that it improves blood sugar, insulin resistance. and cholesterol, but it has also been shown to increase triglycerides, body mass index, and the risk of heart failure (Everyday Health). It is difficult to find links to the actual studies. Palmitoleic acid is found in some types of fish, but the Omega 7 oils that are being promoted for birds are sea buckthorn oil and macadamia oil. There are two types of sea buckthorn oil, one made from the seed and the other made from the fruit. They have radically different fatty acid profiles (Universite Laval). The seed oil contains roughly 38% Omega 3 fat, and most of the rest of the fat content is Omega 6 and Omega 9. That's not as good as the 55% Omega 3 level in flax oil, but it's still very good. The Omega 7 content is less than 1%. But this isn't the type of sea buckthorn oil that's being hyped for birds, even though it's the one that would actually be better for them. The type that IS being promoted for birds is the oil from the fruit, and it's not nearly as attractive. It's approximately 35% palmitic acid - a saturated fat that has been linked to heart disease in humans but is now being reconsidered (Fattore & Fanelli). Sea buckthorn berry oil is also approximately 40% Omega 7. The Omega 3 content is approximately 1%. Various websites report that it has a fairly strong laxative effect, or alternatively that it might cause constipation. WebMD reports a variety of other potential side effects. Personally I don't think this is a desirable oil to feed to a bird. If you feel that you MUST add some Omega 7 fat to your bird's diet, macadamia oil is more attractive than sea buckthorn berry oil. Check out the Typical Fatty Acid Profile chart at International Macadamias Ltd. It shows that macadamia oil is 55-67% Omega 9 (oleic acid). It's 15-21% palmitoleic acid (there's your Omega 7); and roughly 10-18% saturated fat. It has less Omega 7 than sea buckthorn, but your bird doesn't actually need Omega 7 anyway. And it has a much lower level of saturated fat, which your bird needs even less. It's generally agreed that Omega 3 and Omega 6 fats compete for certain resources in the body. Omega 3 tends to be undersupplied in the diet while Omega 6 tends to be oversupplied, for both birds and humans. The standard recommendation is to maintain a ratio of at least 3:1 (Omega 6:Omega 3) in the diet for these fats to make sure enough Omega 3 is absorbed. A lot of the "paleo diet" thinking (which is dubious) focuses on replacing Omega 6 with saturated fat to help improve this ratio. The ratio theory seems to be based on the premise that absorption is more or less proportional to the amount of each fatty acid in the diet. But this does not appear to be true. Several references that say Omega 3 is transported preferentially over Omega 6 in the body. Furthermore the ratio recommendations are based on studies that used a "wretched excess" level of Omega 6 consumption and may not be valid at more normal levels. If this is correct, the real issue is the absolute amount of Omega 3 in the diet, not the ratio between 3 and 6. There's still a need to limit the total fats in the diet of course so there's an indirect influence on the ratio. But if you get enough Omega 3 and enough Omega 6 to meet the basic needs and don't go overboard with fats in general, it might not matter very much what other kind of fats you eat (for humans at least; saturated fat could be problematic for birds that didn't evolve eating it). It looks like the research is very incomplete and the issue is far from settled, but the information seems very relevant to me. For example see Oregon State: "Omega-3, omega-6, and omega-9 fatty acids compete for the same desaturase enzymes. The desaturase enzymes show preference for the different series of fatty acids in the following order: omega-3 > omega-6 > omega-9." The Handbook of Lipids in Human Nutrition says "Omega-6 and omega-3 fatty acids compete for the desaturation enzymes, but both delta-5 and delta-6 desaturases prefer omega-3 to omega-6 fatty acids." Stanford University says "It turns out that both the omega-3 and omega-6 pathway utilize the same enzymes, and both omega-6 and omega-3 fatty acids have to compete for these enzymes in order to produce their final product. Studies have reported that the enzymes used in these pathways were found to prefer the omega-3 pathway. It turns out then that in diets high in omega-3 fatty acids, most of the enzymes will be “busy” converting the omega-3 acids." "Some commentary on the so-called omega-6:omega-3 ratio which is readily referred to in the popular press and in the marketing of various nutritional supplements needs to be briefly addressed herein. The omega-6:omega-3 concept originates primarily in the early rodent experiments where high levels of LA (omega-6) in the diet were found to partially suppress the conversion efficiency of dietary ALA to EPA plus DHA in the body... Early animal studies that used excessively high levels of dietary LA (n-6) relative to ALA (n-3), giving rise to very high omega-6:omega-3 ratios, resulted in a smaller rise in DHA/EPA levels in tissues due to the competitive inhibitory effect of LA and ALA at the level of the initial desaturation reaction. Thus, lower ratios of omega-6:omega-3 were found to provide for a somewhat better conversion efficiency of ALA to DHA/EPA as compared to higher omega-6:omega-3 ratios even when the amount of ALA was fixed at the same amount. These animal experiments have influenced subsequent dietary recommendations, such as those from Health and Welfare Canada in 1990 where they recommended that attempts should be made to reduce the omega-6:omega-3 ratio in the Canadian diet to approximately 10:1 down to 4:1. Subsequent human studies have indicated that lowering the LA(n-6):ALA(n-3) from higher levels (e.g., 27:1 down to 3:1) does allow for a somewhat moderately enhanced conversion of dietary ALA to EPA as revealed by moderately higher levels of EPA in blood samples taken from subjects given varying n-6:n-3 ratios and amounts of ALA. Thus, higher intakes of ALA and much lower ratios of LA: ALA is one strategy for moderately enhancing the conversion of ALA to EPA via the desaturation/elongation reactions presented in Figure 2. However, it is most interesting to note that numerous human studies which have lowered the n-6:n-3 ratio (as LA: ALA ) have not shown a significant rise in DHA with the lower ratios or even with higher intakes of ALA despite the moderate rise in EPA as mentioned previously." In plain English, humans who lower their ratio from a high level to a much lower level will have a moderate improvement in their utilization of ALA. But humans can't use ALA very well to begin with, and birds do a much better job of it. Since birds are doing pretty well already, it's questionable whether they would get any extra benefit from a lower ratio. I don't know of any studies in birds, but here are a couple of studies on other animals that found that Omega 3 dose effects were independent of the ratio to Omega 6. Based on the evolutionary divide between fish and dogs, I would guess that the apparent preference for transporting omega 3 is very ancient. Fish have been around for a lot longer than birds and mammals, and if they've got this preference it seems likely that the animals that evolved from them (meaning all the other vertebrates) have got it too. A study by Goyens et al varied the amount of both Omega 3 and Omega 6 while keeping the ratio the same at 7:1. They found that ALA was converted to EPA at a higher rate when the intake of both fats was lower, although the absolute amount that got converted was higher when intake was higher (see Table 1 of the paper). They concluded that the absolute amount of Omega 6 had an impact on the Omega 3 conversion rate, not the ratio. The conversion rate stayed about the same for DHA, so the absolute amount converted to DHA was also higher when consumption of both fats was higher. How do we reconcile the lower EPA conversion rate with the finding that Omega 3 is transported preferentially over Omega 6? My guess is that is that the fatty acids arrive at the "transportation center" gradually not all at the same time, and a higher percentage of Omega 6 ends up getting transported because it was ready and waiting to go before some of the Omega 3 had arrived. In addition, the recommended 3:1 ratio for humans appears to be nothing more than an estimate with little evidence behind it. It's based on the estimated amount consumed by pre-agricultural humans, coupled with the improbable assumption that the we did not evolve at all to adapt to the changed diet that came with agriculture. Evolution can be very rapid when conditions change, and a change in food resources is a major driver of evolution. A.P. Simopoulos seems to be the primary promoter of the "historical ratio" idea, but the evidence presented in her papers is weak and she mostly cites herself as the source of evolutionary diet information. Paleolithic humans had limited access to high Omega 6 foods like grains, but many pet bird specifics have been granivores for millions of years. A bird's "historical" Omega 6:3 ratio is likely to be very different from that of an ancient human. So even if the 3:1 ratio is best for humans, we can't assume that the same ratio applies to birds. How much Omega 3 is needed? If it's the absolute amount of Omega 3 that matters rather than the ratio, then the next question is "how much is enough?" The answer to that question might not be known at present. FWIW there are a few pellet companies that provide information on their Omega 3 content, but I don't know whether this is a level that they set out to achieve or if they're simply telling you what's there without knowing how adequate it is. Higgins Intune cockatiel size has 5% total fat and the Omega 3 is 0.4%. 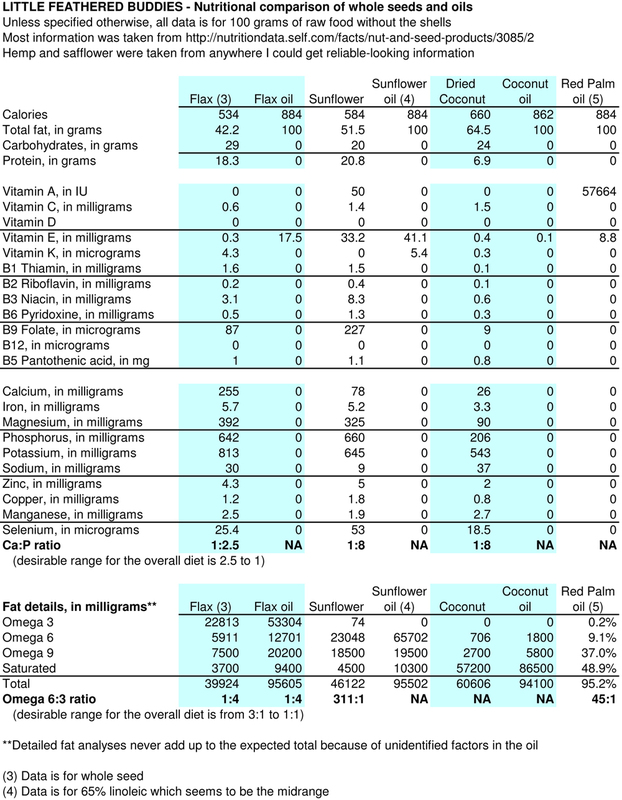 Kaytee Exact (both rainbow and natural) is 5% total fat and the Omega 3 is 0.5%. Mazuri's small bird breeder formula is 6.5% total fat with 0.63% Omega 3. Lafeber's cockatiel premium daily diet is 5% total fat and 0.33% Omega 3. This info comes from the charts at the bottom of my pellet article. Recommendations for humans that talk about percentages call for Omega 3 fats to be at least 0.5% of total energy intake (Omega 3 Institute, Nutri-Facts). The amounts in the pellets mentioned in the last paragraph would meet this requirement. The National Academies Institute of Medicine specifies an acceptable range of 0.6% to 1.2%. "Optimal levels of omega-3 fatty acids for Psittacines are unknown. Experimental data from poultry studies typically evaluate the effects of omega-3 supplementation on growth and reproduction rather than optimizing maintenance of good health in adult birds. Linoleic acid fed at 1% of the diet appears adequate for growth and reproduction in domestic galliformes. Extrapolating from this at 10:1 would result in omega-3s comprising at least 0.1% of the diet. It is preferable to replace existing fat in the diet with omega-3s rather than adding additional fat. Adverse effects of omega-3 supplementation appear limited to those of excessive fat consumption, such as obesity and diarrhea; however, omega-3 fatty acids usually result in less fat deposition than an equal amount of omega-6 or saturated fatty acids." Per avian veterinarian Scott Echols on the Nutrition for Pets Facebook group, "I supplement linolenic acid [ALA] at 0.22-0.44 cc/kg of animal body weight orally daily". The dosage rate information for VetOmega indicates that this is the dosage rate for an oil that is mostly flax, not for pure ALA. ALA is the form of Omega 3 that is generally recommended for birds. For EPA/DHA supplementation Dr. Echols recommends 300 mg per 10-40 pounds of animal body weight, but this is primarily for mammals. These are small amounts of ALA. Based on Dr. Echols' recommended supplementation level is for oil, I calculated that 6 to 12 flax seeds would supply the recommended daily amount for the average cockatiel. Here are my calculations, for anyone who would like to calculate the amount needed for a different-sized bird (or maybe just check my accuracy). Oil recommendation is 0.22 to 0.44 cc per kg of animal body weight daily. I can't actually tell what's in the VetOmega or how much Omega 3 it provides. But the owner of the company generally recommends an Omega 6:3 ratio of 1:3, so presumably that's what this product delivers. Chia and kiwi seed deliver this ratio, while flaxseed and perilla have a slightly better ratio of 1:4. If a cockatiel weighs 100 grams the dose is a tenth of that, so 1/200 tsp of oil daily. Multiply by 3 (see below**) to get the amount of whole flaxseed needed to meet lower boundary = 1/66th teaspoon daily. 50 dried kiwi seeds (not available for purchase, you have to dehydrate the kiwi yourself. 50 fresh seeds are expected to provide the same amount of ALA but will probably take up more physical space than the dry seed). We need 60% of the amounts above to satisfy the upper boundary recommendation (1/20 of a teaspoon is 5/100 and 1/33 tsp is 3/100). 20 flaxseeds x 60% = 12. The lower boundary is half this much = 6 flaxseeds. The equivalent amount for perilla seed is 8 to 16 seeds, for chia it's 28 to 56, and for kiwi seed it's 15 to 30. How does this compare to Lafeber's estimate that ALA should be at least 0.1% of the diet? Our 100-gram cockatiel needs 29 to 33 calories a day depending on activity level (see chart in Calories article); round that off to 30 calories. NutritionData says that a teaspoon of flaxseed has 11 calories from fat and 53% of this is from ALA= 5.83 calories from Omega 3 per teaspoon of flaxseed. The amount calculated above is 1/66 to 1/33 teaspoon per day, which works out to 0.09 to 0.18 calories from Omega 3. This is 0.3-0.6% of the energy level in a 30-calorie diet.